Abidjan is a sprawling city which houses over 4 million residents. It is divided into two parts: North and South which is separated by the Lagune Ebrie. There are 3 bridges which connect the north and south with the newest, Henri Konan Bedié Bridge, being completed in 2014. You can read more about this and more in our Getting Around section! 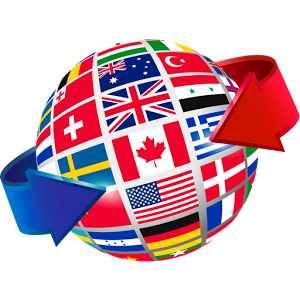 There are many safe residential areas throughout the city, and choosing the one that suits you best will have to do with where you work, whether or not you have children attending international schools and what your budget is. Traffic can be a problem during peak hours, so it is also beneficial to know your commuting path as well. For historical reasons, as well as safety and convenience, most expatriates live in Cocody or Marcory. However it is important to point out that some traditionally working class neighbourhoods such as Yopougon, Abobo, Koumassi and Port-Bouet have sub-divisions with housing that meets expatriate criteria. In response to the acute housing shortage in Abidjan, private developers have built affordable and middle-class housing in these areas. Cocody - This area has long been favored by the Ivorian elite and expatriates living in Côte d'Ivoire. It covers an area of 132 square kilometers which is about 20% of the total size of Abidjan. Many of the foreign embassies are located in this district as well as most of the international schools. It is well known for its residential neighbourhoods (e.g. 2-Plateaux, Riviera), University Félix Houphouët- Boigny as well as some other private universities. This district has a number of shopping options, including Cap Nord in Riviera, and the Rue des Jardins in 2 Plateaux. This district is extremely large and some parts of it are plagued by serious traffic during rush hour. If you're looking for housing in Cocody, you will hear many of the sub-neighborhoods mentioned which are all located in this district. The housing here is diverse ranging from apartments and small villas in the 2 Plateaux Vallons section, to large villas, many with swimming pools in the Riviera neighborhoods. Plateaux 2 (Deux Plateaux) - One of the favorite neighborhoods for expats in the north district, there are many restaurants and businesses here. There is a mix of apartments, villas, and houses here. Cocody Proper - This is one of the more exclusive neighborhoods as many government ministers and diplomats live here. Historically, it is also where the President lives. Riviera 1 or Riviera Golf - This area is quiet and secure with mostly apartments and is right across from the lagoon. It is also close to Bridge 3, making it ideal if you commute to work in the South District. Riviera 2 - Located right after Riviera Golf, there are more villas/houses available here. It is also a family neighborhood. Riviera 3 - Located to the west of Riviera 2, this is a very suburban neighborhood and there are many spacious homes here to rent. Riviera 4 or Beverly Hills - The most exclusive of the Riviera neighborhoods, this is also home to many diplomats and officials due to its large luxurious homes. Riviera 5 & 6 - These are the newest areas which are still mostly under development. 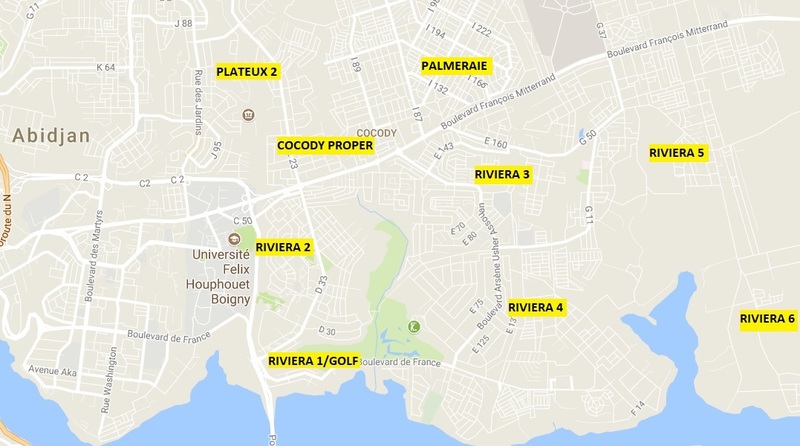 Palmeraie - This area is relatively new and is made up of new apartment buildings and villas with affordable rents. 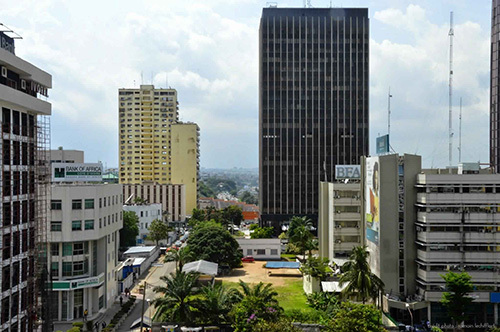 Le Plateau - This is known as the Business District of Abidjan and boasts some nice views of the Lagune from the high rise offices and apartments here. It is in fact the administrative, commercial and financial centre of Côte d'Ivoire. The majority of residences in this area are high-end and mid-range luxury apartments. Some expats who work in the business district choose to live here to avoid the traffic during commuting. This district is extremely busy during business hours but empties out on weekends. Most people living in this area will want to have a car, since transportation will prove difficult at night or during weekends. Bingerville is the area where many colonial buildings have survived, is also known for its huge botanical gardens. ​Bingerville is home to the Military Academy known as EMPT (École militaire préparatoire technique). There is also an inter-African school called the Centre des Métiers de l'Electricité and the School of Applied Arts, often referred to as l’École de sculpture Combes, its museum has giant ancient sculptures. There is a lot of new construction taking place in this district. For people seeking to buy plots of land and build their own houses, this is one of the prime locations. That said, traffic can make commutes to the central business district difficult. Abobo is the second most populated commune of Abidjan. It houses many refugees and working class migrants . This area grew spontaneously around its busy bus station. Adjamé is small in size, however this commune is very important for the Ivorian economy, given the number of commercial activities that take place there. It has the city's largest market that houses a realm of shops and a bus station that feeds bus lines which travel throughout the country and neighbouring countries. Unfortunately, Adjamé experiences serious sanitary problems and is known to have security risks. Yopougon is the largest and most populated commune of Abidjan. It has many industrial and residential areas. It is home to the research station ORSTOM, Pasteur Institute and a University Hospital. Marcory Residentiel - Separated from Zone 4 by the large road - Boulevard Valery Giscard d'Estaing - this is the most residential of the area with many nice houses and manicured lawns. There are also many high end shopping malls nearby. Zone 4 - The "place to be" for restaurants and nightlife, this area has developed with many western restaurants and bars alongside new luxury high rise apartments. There are very few stand-alone houses here and the area is rapidly developing. Bietry - The furthest south of the district, it is still very industrial. But there are some nice apartments with views of the lagoons it is still within walking distance of the restaurants in Zone 4. Treichville - This commune houses the Port of Abidjan and its industrial area and many shops. There is also the State pool of Treichville (PET), the palace of sports Treichville, the Palace of Culture, Rue 12, The Abidjan racetrack. It is a very popular neighbourhood with west African tradespeople who sell their goods in the many local markets in this district. Because of this, it is also sometimes referred to as the ECOWAS ( ECONOMIC COMMUNITY OF WEST AFRICAN STATES ) neighbourhood of Abidjan. Koumassi - This commune has an important industrial area and its intersection that leads to Koumassi’s large market is one of the widest boulevard of Abidjan. It is a very populous neighborhood with over 300,000 inhabitants. Port-Bouet - This is a working class area near the airport and also has a sub-neighbourhood, Vridi, which is an industrial town close to the sea. Its beaches are busy every weekend, although the ocean there is very rough. Swimmers are cautioned not to move too far away from the shore. The new highway running east from here takes a scenic coastal drive to Grand Bassam - a coastal city located about 30 minutes the airport. Choosing the right district based on your needs is important! Once you've chosen your district, we recommend you travel over here to check out the Real Estate Information to start your search!